So…..be honest. When you first heard about this next episode, about how the crew was finally going to set out to meet one of the most vile, wicked, despicable characters in the entire Kirkmanverse….were you expecting the biggest villain of the hour to be Abraham? 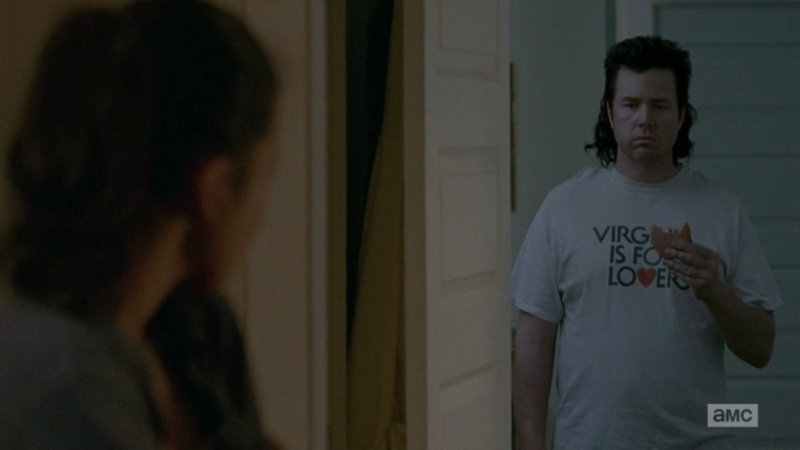 It is saying a lot that I can think of few things I’ve seen on The Walking Dead that were more stone cold than this. How can I be expected to look at Abraham the same way after this scene? He can do all the supercool badass things he wants, he can fire all the rocket launchers in the world and he will still remain the guy who callously smashed Rosita’s heart into a thousand pieces. It’d be hilarious if next episode he turns around to see Sasha kissing another man. Being forced to kill was the main theme of this episode among multiple characters. Many have died by Carol’s hand so far, and we’re shown that it does affect her through a glimpse at the little book she keeps by her bedside, which has a tally of everybody she’s slain. Heath was nervous about the impending fight and admitted to Glenn that he had never killed a man; Glenn in turn admitted that he hadn’t either. With how frank he was being about it, it felt like this was the episode Glenn was going to lose his murder virginity (and it was). It’s not wrong to think Rick is totally rushing into this, because he is, but there was some logic in his argument to the Alexandrians. 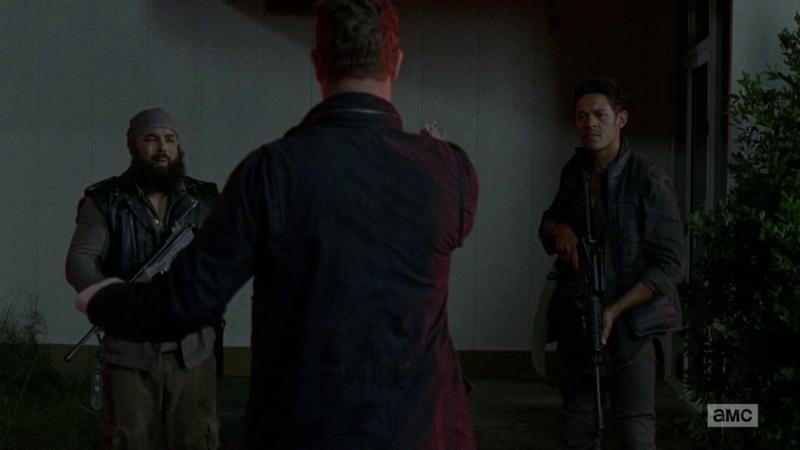 Negan hadn’t found them YET, but it was only a matter of time until he did, and they could either strike now with the element of surprise, or surrender that element to him. Most of the townspeople joined his army. The guy from the Hilltop who attacked Gregory was supposed to bring evidence of his death to Negan’s compound. Gregory is still alive, but doing what he says was the one foolproof method to get the doors open. So they gather three Walkers, cut off their heads (one of which resembles Johnny Depp), and pick the one that most closely looks like Gregory. This really stretched believability; given how rotted the average zombie they come across looks, what are the odds they would find TWO fresh-looking ones on the same day, let alone THREE that looked sort of like Gregory head-wise? Well, anyway, it worked. These guys played the act perfectly. As soon as they came out of the compound and started talking, the hair stood up on the back of my neck (figuratively). There was nothing Hollywood about this. This is exactly how a gang of people who are going to hurt you talk in real life. They hoot and holler and jeer, they swear like sailors, they basically chatter like little children because that’s what they’re like. They’re not angry or grimacing with hatred — they do what they do because they LOVE it, because harming and terrorizing other people makes them feel really GOOD. And they scare me more than any Walker ever could. The team got very lucky here: they were prepared for the fight of their lives, but it turned out aside from the three or so jerks standing watch outside and waiting for Gregory’s noggin, the majority of them were fast asleep. 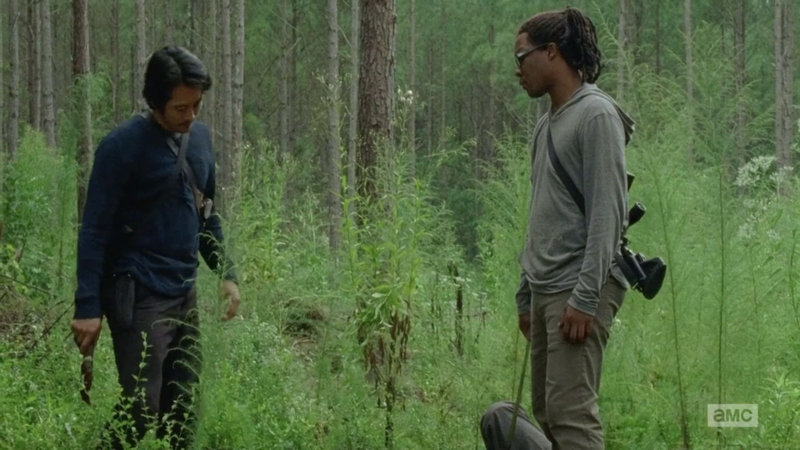 Great if you’re Rick or Daryl; not so much if you’re Glenn or Heath. Glenn has been dreading this moment all day and now it’s been made worse: his first kill has to be someone who’s completely defenseless. 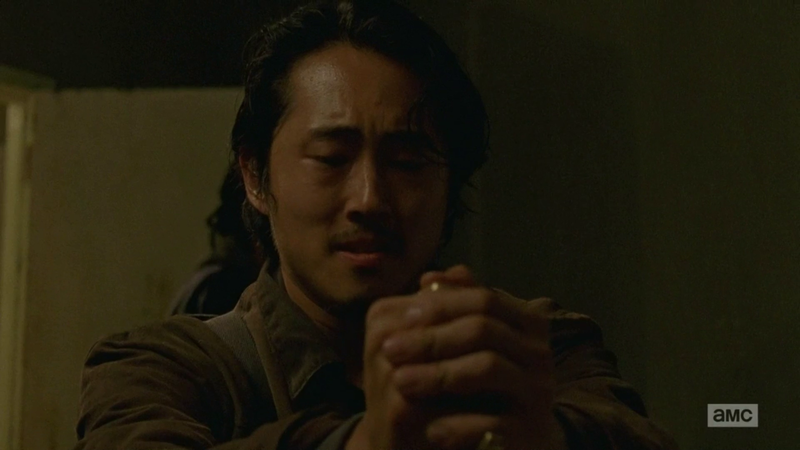 Yeun did a great job capturing the uneasiness and “there’s no going back from this” look on Glenn’s face. Heath was on the other side of the room with another sleeping man dreading having to go next, but Glenn pushed him aside and silently insisted there was no way both of them were going through this tonight. The advantage finally ends when one man can’t sleep and gets up to use the lavatory, running right into Sasha and Abraham. Before they can catch him, he lunges for the fire alarm, and it occurred to me while watching this how video gamey it all was. Having to assassinate an entire compound of soldiers without making a single noise would be a fun, tense level to play. Too bad it’ll never happen with today’s shooters having a heavy emphasis on multiplayer — just try to keep a gang of four completely quiet. 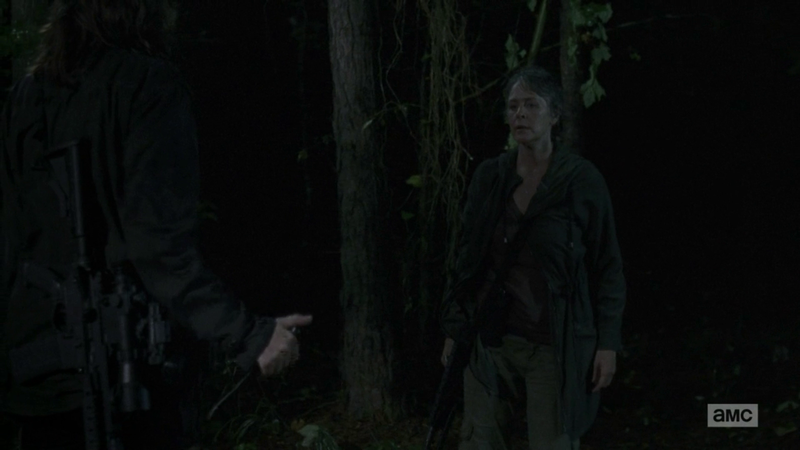 Maggie hears the alarm and immediately rushes for the compound, but Carol tries to stop her. It might be dumb, but it’s fully within Maggie’s character to rush into this, even if she was more pregnant than she is now. So, probably, would Carol were she young enough to be preggo, but Carol is also a strategic thinker and knew Maggie’s addition would be bad. We don’t see them after this, so I don’t know if Carol succeeded in keeping her away, but in the end it didn’t matter. 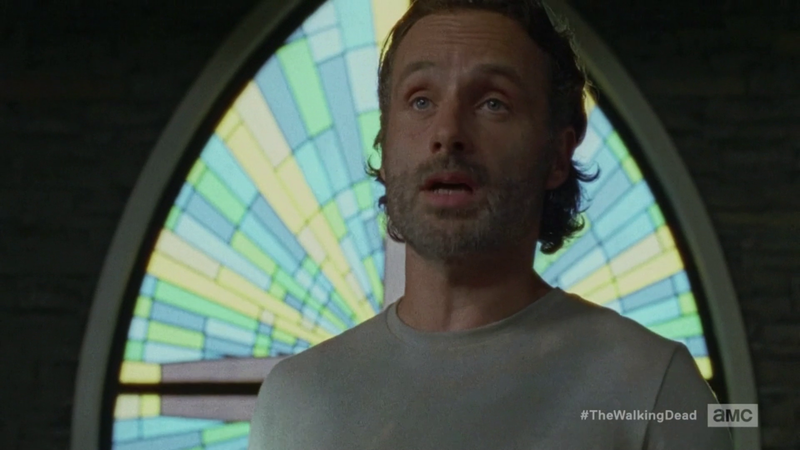 For a time, it actually looked like Rick’s bubble of cockiness wouldn’t be busted: they really did rush right for Negan’s gang, took them out and rescued the hostages, just like they boasted they would. 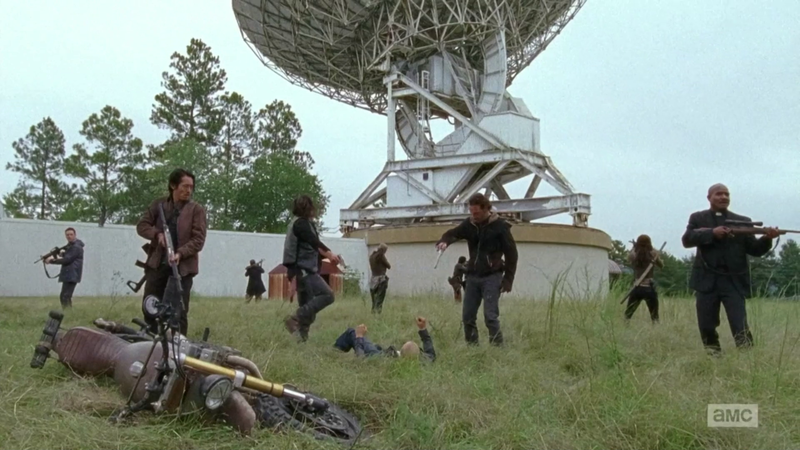 But then one survivor BLAZES out of the compound on what looks like Daryl’s motorcycle. Daryl lunges, tackles the man off the hawg and demands to know where he got it. Why did this guy not wait until everyone was gone before making his move? Because he didn’t need to. A voice suddenly cracks over the walkie-talkie he was holding. The female on the other end reveals the whole gang is being watched from somewhere, and that they need to hand over that man pronto, or the two people they have prisoner will be executed. Indeed, it’s Maggie and Carol. This is far from over. Aside note: romantic relationships have never been this show’s strong point, and we saw a pretty blatant example in this episode. Carol is sitting with some guy smoking a cigarette, they have a conversation….and then they kiss at the end. There was no lead-up, no flirtation, I barely even know who this person IS. How do they expect this to mean anything to us? We’ve also seen no evidence that the Richonne moment from two episodes ago was anything more than a fling, because ever since, it’s been like it never happened. Heck, the only truly touchy-feely scene in the episode was given to Fake Doctor of all people, and this is a problem since she’s the worst female on the series since Lori and I can’t bring myself to care if she falls into a tree shredder. People aren’t tuning into The Walking Dead for soap operas anyway, but a little more effort into making the dating non-wooden would be nice.